One of the great things about being retired is the way you can just take off on holiday whenever you please. Recently my friend asked me if I would go to Budapest with her. She wanted to get some dental work done, and the dental clinics in Hungary are a great deal cheaper than in the UK. I believe this is called health tourism! I jumped at the chance to go along with her. I’m a great fan of a nice hotel breakfast, sets you up for some busy sightseeing. it was interesting to see what a Hungarian buffet breakfast would be like. In the restaurant, there was a large central buffet area. Walking around there was a cold section with a variety of cereals and mik, fresh fruit, platters of cured meats, ham and cheese with bread rolls, sliced bread and pastries. For the hot section, there was scrambled egg, boiled eggs, omelette, fried potato wedges, spicy vegetable chilli and cooked spicy sausages. So I had a plate of the vegetable chilli with potato wedges and spicy sausage, very tasty it was too. One of the first things I like to try in a new country is their coffee. At the breakfast buffet in the hotel the coffee was just out of a machine so very similar to the coffee we would be served in a hotel in the UK. 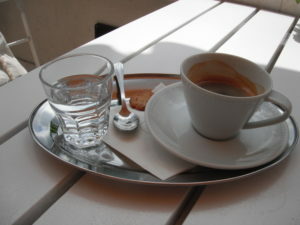 As you can see in the photograph below the coffee in typically served on a tray with a glass of water. I asked the waiter why the coffee is served with water and he said it was to cleanse your palette between sips of coffee. The coffee was made in a machine and is similar to an espresso but not quite so strong, I enjoyed it very much. The sips of water between sips of coffee worked very well. I had heard a saying that you won’t go hungry in Hungary and this is certainly true. The food is served up in large portions, hearty mid-European style, in a way similar to German foods. On the menu are plenty of meat dishes, like kebabs, schnitzels and beef steaks. Which are served with heaps of tiny dumplings, rice or chips. All the waiters spoke good English and were pleasant and friendly, the menus were in English as well!. My favorite meal was a large veal schnitzel I had in a restaurant opposite the Dohány Street Synagogue. The favorite meal my friend had, which was confit duck, was also in that restaurant. 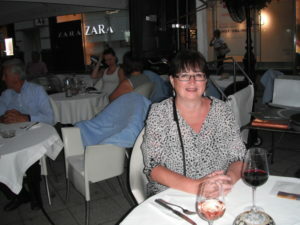 In the picture below we are sitting in a restaurant outdoors near to Deák Ferenc square. 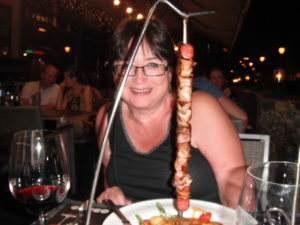 Here is a picture of a delicious mixed meat kebab in one of the restaurants near The Hard Rock Cafe. Sorry, I can’t remember the name of the restaurant. 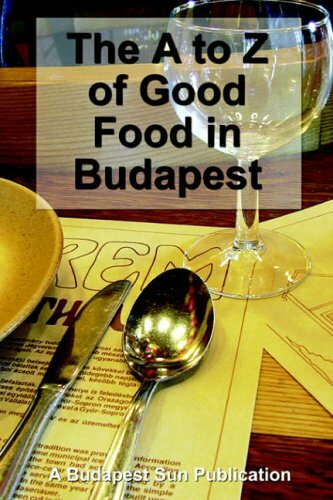 We decided to eat in Hungarian restaurants, but there would be foods for anyone to enjoy catering for any tastes. I saw Thai, Italian, Indian and American and Mexican. I thought I knew what Hungarian Goulash was, in fact, I have even made it at home from a recipe book. Wrong! In Budapest goulash is served as a kind of soup, and is available in most restaurants. The soup is made from cubed beef, root vegetables and either little egg dumplings called Csipetke or rice on the side. The soup is flavoured with plenty of Hungarian paprika. We often had this goulash soup for lunch. I love to drink red wine, in Budapest, this was always delicious, and very cheap. I always asked for the house red. My friend drank rose wine and enjoyed that very much. Strangely if you ask for a glass of wine it comes in a 100ml portion, which looks just like a mouthful! We learned quite quickly to ask for a double so we had a decent glassful of 200ml! The Metro Closes Earlier than you would think! One night we stayed out later than usual about 11.30pm, and we took the Metro back to out hotel. For this journey, we had to change Metro lines. While changing the line, we heard an announcement that the underground system was closing for the night and we had to leave the station. When we got back up to street level we simply did not know where we were! We stood in a large square in the distance were some taxis so I said to my friend we will have to go back to the hotel by taxis. Then just out of the nowhere a Hungarian man appeared with a rickshaw. He offered to take us back to the hotel for about £12 so we thought why not. It was such fun flying through all the back streets of Budapest. The poor cyclist worked so hard to get any speed up having to stand up on the pedals. He got us back to our hotel in super quick time. We were laughing and waving to all the passers-by, perhaps we were a little merry from drinking wine with dinner. 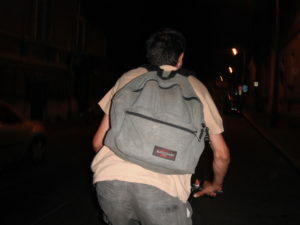 Below is a picture of the back of the rickshaw owner. In our hotel (The Hungarian City Centre Hotel) there was a bar, but we didn’t like it very much. It was in a rather dark corner of the hotel foyer, the Hungarian lady that served the drinks was rather dour and unfriendly. So we found a great little bar called Frikka just around the corner from the hotel in Huszár u. (I think the U. stands for street!!). It was run by a Hungarian married couple called Gabriel and Anneka. They made us very welcome. Here is a picture of Gabriel and Anneka. 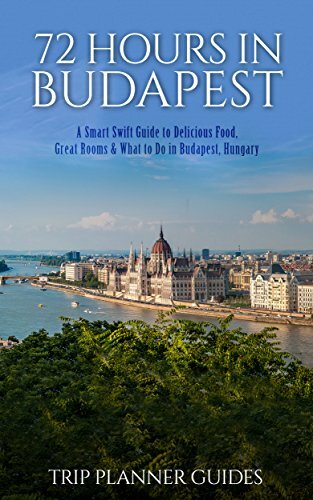 Budapest is a great city to visit and one of it’s attractions is the delicious food, warm welcome and reasonable prices in the cities restaurants and bars. 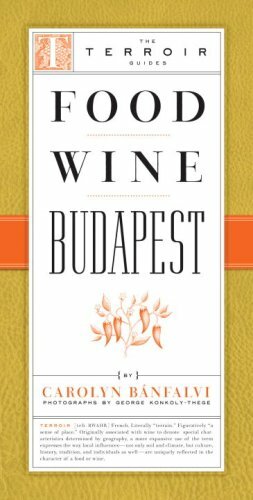 Here are some guide books that feature the food and wine of Budapest. This is the first post I’ve made about my trip to Budapest. I’m going to write about my other experiences soon. 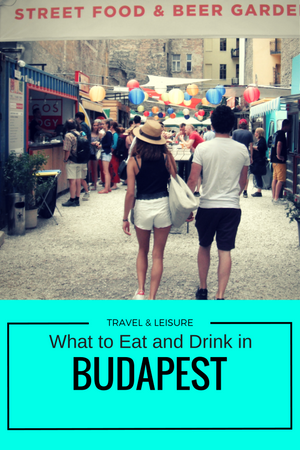 Everything I Ate In Budapest! !